A hypertonic solution is a particular type of solution that has a greater concentration of solutes on the outside of a cell when compared with the inside of a cell. Saline solution, or a solution that contains salts, is hypertonic. This type of hypertonic solution is extremely common. For instance, saline solutions are often used in the medical field, as well as in contact lens fluid, to help keep contact lenses clean and free from dust and pollutants. A solution of 5% dextrose (sugar) and 0.45% sodium chloride is an example of a hypertonic solution - so is a solution of 5% dextrose and 0.9% sodium chloride. Both of these hypertonic solutions are administered in IV drips in hospitals to nourish the body of a sick and injured person who cannot consume food or liquids themselves, or to individuals who happen to be dehydrated. If a cell contains a concentration of 75% sodium chloride (NaCl), then any solution with a higher concentration of sodium chloride is hypertonic to it. This is true of all hypertonic solutions. A hypertonic sodium chloride solution is a solution that has a higher combination of both sodium and chloride than the amounts of sodium and chloride typically contained in the blood plasma of the individual to which the solution is administered. Corn syrup is a hypertonic solution in relation to the cells within a living organism, because the corn syrup solution contains more solutes inside of it than the body cells. Glucose is the sugar present in an individual's blood. An example of a hypertonic solution that has glucose dissolved into it is any plain glucose solution with a concentration higher than 5%. One such example is a solution of 10% dextrose in water, also known by its name D10W. 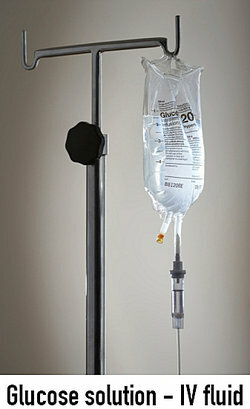 This is often used as an IV fluid. Any solution that allows fluid to flow across a membrane into it is considered a hypertonic solution, since hypertonic refers to any solution with higher concentrations of solutes without than within. When bodily fluids contain too much solutes such as salt, hence becoming hypertonic solutions, the body becomes dehydrated and must be rehydrated, or else a person will become sick. Body systems can become hypertonic due to the lack of water consumption. Kidneys and livers, for instance, can become hypertonic and lead to the failure of these organs. Each of these are examples of hypertonic solutions. Now you have many different examples of somewhat common hypertonic solutions and you can see how often you interact with these solutions. "Hypertonic Solution Examples." YourDictionary, n.d. Web. 23 April 2019. <https://examples.yourdictionary.com/hypertonic-solution-examples.html>.